Illegal gold mining has become a big problem for Tambopata National Reserve in southern Peru. Despite its status as an official protected area, mining has encroached along the river that forms the reserve’s northern border. The activity has supplanted significant areas of forest, and now researchers have found another cause for alarm – gold mining is actually changing the river itself, threatening ecosystems that have evolved there for millennia.Over the past few years, miners looking to cash in on flecks of gold at river bottoms and banks in Peru’s Madre de Dios Department have been encroaching closer to Tambopata National Reserve along the Malinowski River. Then, in late 2015, mining activity jumped over the boundary into the reserve itself. Since then, mining has deforested around 130 hectares of the reserve’s rainforest, with no signs of slowing despite government intervention.Global Forest Watch shows another big surge of deforestation into the reserve may have happened recently, with a large number of tree cover loss alerts recorded over the border in the first week of May. 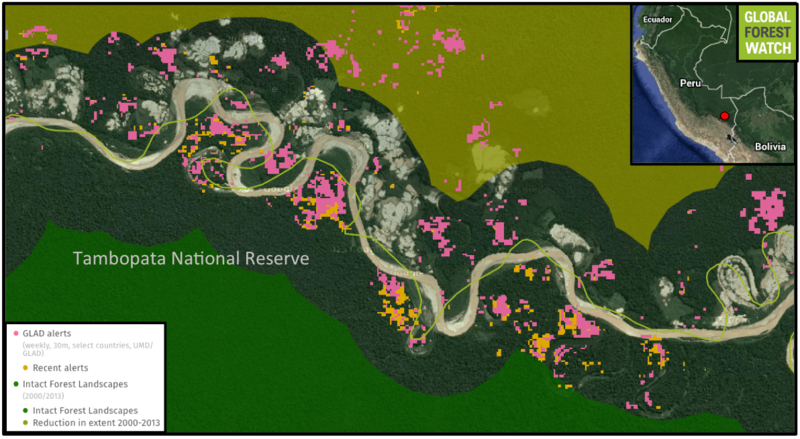 GLAD tree cover loss alerts spanning January 2015 to May 2016 indicate heavy mining-related deforestation along the Malinowsky River and into Tambopata National Reserve (green line). The orange alerts were recorded in the first week of May, and encroach into an Intact Forest Landscape: a particularly large, undisturbed area of primary forest. Tambopata’s forests are home to many plants and animals, like this night monkey (genus Aotus). Photo taken in Tambopata National Reserve by Rhett A. Butler. The region’s forest cover isn’t the only thing changing. Researchers at the Monitoring the Andean Amazon Project (MAAP) analyzed satellite images of the Malinowski River captured between 2013 and 2016. They show in their analysis published last week that areas dug out for mining have changed the course of the river, effectively cutting off 4.4 kilometers (2.7 miles) of the river’s length. Of that, 1.7 kilometers were removed between April and May of this year. Rivers often naturally shift their courses, and the Malinowski is no exception. Its path was used to set the boundary of Tambopata National Reserve, but it has since unmatched itself as its oxbows waxed and waned. However, river course deviation by artificial means can be destructive. Gold mining – even small-scale mining like much of that done in southern Peru – excavates lots of sediment, displacing it into the river. Deforestation of riverbanks, which often accompanies gold mining, can add insult to injury; without tree roots to hold in the soil, more sediment is washed into the water. This can have potentially devastating effects on organisms that haven’t evolved to live in murky water. MAAP researchers Matt Finer and Sidney Novoa consulted with river ecologists familiar with the Malinowski, who warned of potential dire impacts of mining on the river’s wildlife. “The Malinowski River, since it is a tributary of the Tambopata River, has natural áreas that are crucial to the reproduction of many local species,” write Finer and Novoa. “Its tributary streams represent habitats that differ from the main river and harbor an incredible variety of fish and invertebrates that contribute to the biodiversity of the river basin. Satellite image from March 2016 showing original and new flow directions of the Malinowski River (and bank degradation from mining). Image courtesy of MAAP. Sediment isn’t the only thing gold mining releases into water. Mercury is often used to collect ore, as it attracts tiny bits of gold into a larger conglomerate. Miners then burn off the mercury, where it escapes into the air and water. Mercury magnifies up the food chain, and is found in high levels in predatory fish in several places in South America that are host to gold mines. In Madre de Dios, the Peruvian department where the Malinowski and Tambopata rivers are located, a 2013 study found several fish species contained levels of mercury that were in some cases twice as high as the U.S. Environmental Protection Agency safety threshold. The heavy metal acts as a neurotoxin if consumed at high enough levels, impairing cognitive function and causing birth defects. In addition to affecting water quality, the researchers say rerouting of the Malinowski will alter the river’s behavior and, consequently, the behavior of fish communities. They warn that flooding patterns will change and the river’s flow will slow, potentially leading to damming of the confluence of the Tambopata and Malinowski. As mining straightens out the once-winding Malinowski, the river is effectively shortened and its fauna have fewer places to go. The team writes that this could bar fish from migrating up and downriver to feeding and breeding areas, potentially dooming populations – especially those that depend on fluctuant forest resources like seasonal fruit. Efforts by the government to stamp out mining activity along the Malinowski have been largely unsuccessful. Interventions in January that destroyed equipment and thousands of gallons of fuel was followed by yet more mining as the price of gold shot up at the start of 2016.